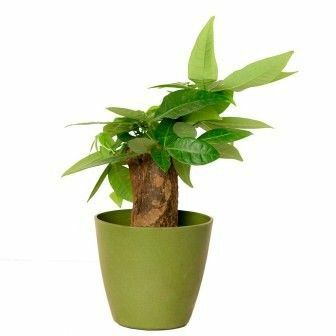 The Money Tree is a plant every plant lover wishes to grow. This Bonsai is grown with a twisted trunk that makes it look beautiful and wonderfully grown. The tree requires little maintenance and should be watered on regular basis. Twisted trunk will bring positive energy and wealth to your home or office space. The tree comes in a light weighted, beautiful and strong fiber pot. If you desire to give it as a present, then plant with the beautiful green pot is perfect. Dos: 1.Ideally keep them at a place which gets 3-4 hours of morning/evening Indirect Sunlight. 2.DO the pruning of old leaves which turn yellow to avoid fungal attack. 3. DO check the coco peat before watering . A plant will use different amounts of water seasonally. Ideally water them every alternate day for roots to get optimum supply. 4.Put manure every 6-8 months for better results. Donts: 1. DON'T give them direct sunlight otherwise there leaves might get burn 2.As the plant will take the needed amount of water itself so DO NOT overwater it . The most common cause of houseplant death is over watering 3. Avoid temperature shock for better growth.